Japan starts the week with a holiday, BOJ to meet these days. 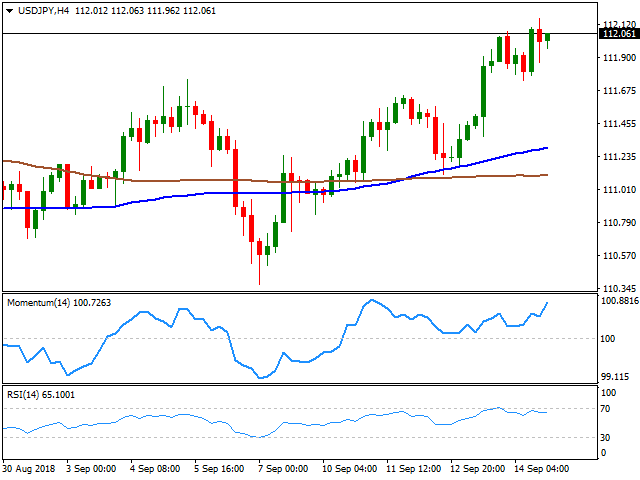 USD/JPY has room to extend gains up to 113.17, July's monthly high. The USD/JPY pair reached Friday 112.16, surpassing August high by a couple of pips, amid broad dollar's strength triggered by strong US data, retreating just modestly afterward, as US equities retreated from highs on renewed global trade tensions. However, US indexes managed to close the day mixed, not far from their opening levels, helping the pair to retain the 112.00 threshold. Additionally, US 10-year Treasury yield hit 3.0% for the first time in over a month, lending additional support to the pair. Japan will start the week with a holiday, but the BOJ is having a monetary policy meeting, with the outcome being out early Wednesday. The pair is trading in positive territory but lacks momentum to confirm a bullish continuation ahead, given that, in the daily chart, technical indicators have hovered within familiar levels, the Momentum still heading lower and the RSI now flat around 60. In the mentioned chart, the pair is consistently holding above moving averages, although the 100 DMA has lost upward strength. The 4 hours chart offers a more positive stance, as the pair extended its advance above its moving averages, the Momentum maintaining its bullish slope near monthly highs, while the RSI consolidates at around 65. A steady advance beyond the 112.15 price zone will open doors for a test of 113.17, July's monthly high.